Nestled in lush greenery between lake 2ha and the Hérault river, fully equipped villa (6-7 persons), 3 minutes from the highway A750 Gignac exit, proximiter attractions in renowned international (st. Ghuilem Desert, Lake Salagou, Causses and Larzarc) 40 minutes from the beaches (Cap d'Agde, Sete, Palavas, the Grande Motte) The villa is a villa located in the heart of the Languedoc vineyards, it is bright and furnished comfortably. It was equipped with nine. The large mezzanine living room opens onto a terrace facing the Southeast. It is sunny all day, and the terrace offers shade for outside dining. A Gignac 4km, you will find all the usual amenities walk and all kind of shops and services. The house is very well located to offer you a holiday of relaxation and tranquility while being close to the attractions of the area. 1 bathroom on the ground floor with shower, 1 bathroom upstairs with bath. Fitted kitchen. tv. HiFi Garden furniture There is no pool, but the lake is suitable for swimming on nearly 1ha. with a variable depth from 0.50 to 3mt. will delight young and old. Similarly, the Hérault river that borders the property lends itself to all the sweet water activities. We had a lovely holiday in lovely warm sunshine with three adults and four children comfortably accommodated in the villa. It was large spacious accommodation with a nice shady terrace good for relaxing and a fire BBQ. The provisions were basic but suitable. Our dog was made very welcome too. The lake close to the house was too shallow due to the hot weather but the river nearby was spectacular and we swam and boated every day. Kayak and paddle board were provided. Nearby in the location we enjoyed a visit to Saint Guilliem and canoeing on the lake rapids. A lovely swim at Pont Du Diable. We visited Cap Adge beach and Lake Salagou. We visited Montpellier. Everything was in easy reach by car. Thank you to Nathalie for her hospitality. All in all too short our visit of only 1 week. We didn't use much of the facilities in the house, as we were out all day. The boats were a little out of shape, but if we had more time I am sure we would have enjoyed going for a small trip in the lake. The house was very comfortable, but could have been cleaner when we arrived. It didn't bother us though, as we spent most of the time outside. And actually we missed some hammocks, sun loungers or similar outside, to take a little nap in the evening. I can highly recommend this place for the family who wishes to be in the center of Languedoc area and explore all the that it has to offer, and at the same time stay in a remote and natural surrounding. We went to the Grottes de Clamouse which has beautiful. And the same day swimming close to the Pont de Diable in the town of Saint-Guilhem-le-Désert. Very nice for the kids as it has many places with shadows and an excellent place to bring a picnic basket. Though a little rough as it does not have sand but pebbles. Larger beautiful cities we can recomend Beziers with the Canal du Midi and the Cathedral. But especially Narbonne, which was so beautiful and interesting. Go before 12:00 to see Les Halles (market place) in action and eat lunch in one of the little shops inside. There is so much life and atmosphere. Merci à vous deux, ce fut pour nous une belle rencontre. Au plaisir. Super vacances deuxième séjour dans cette région et on adore surtout les Cascadelles, les gorges de la Vis et celles d’Héric. Nous avons beaucoup appréciés l’accueil de la propriétaire rien à redire et le cadre est sympa et calme. Nos filles on bien profité de l’etang ainsi que de la rivière accessible depuis le domaine. En conclusion vacances super et merci à la propriétaire qui est très à l’écoute. Voilà pourquoi nous aimons ce métier: pour l'échange et le plaisir de belles rencontres. Une trés bon accueil des propriétaires ! Merci, de ce retour positif, c'est toujours un plaisir pour nous. Très bien situé, très agréable, spacieux même pour 7, ce gite permet un séjour très agréable. Meublé un peu sommairement, l'indispensable y est. Très bon rapport qualité/prix. The house is very well situated to offer you a holiday of relaxation and tranquility while being close to area attractions and many activities. The Mediterranean coast is 45 minutes south. The hills and Causses and the Cévennes mountains to the north, the vineyards and villages of the Hérault Valley to the east. Montpellier, capital of Languedoc, is 30 minutes and the airport 45 minutes. 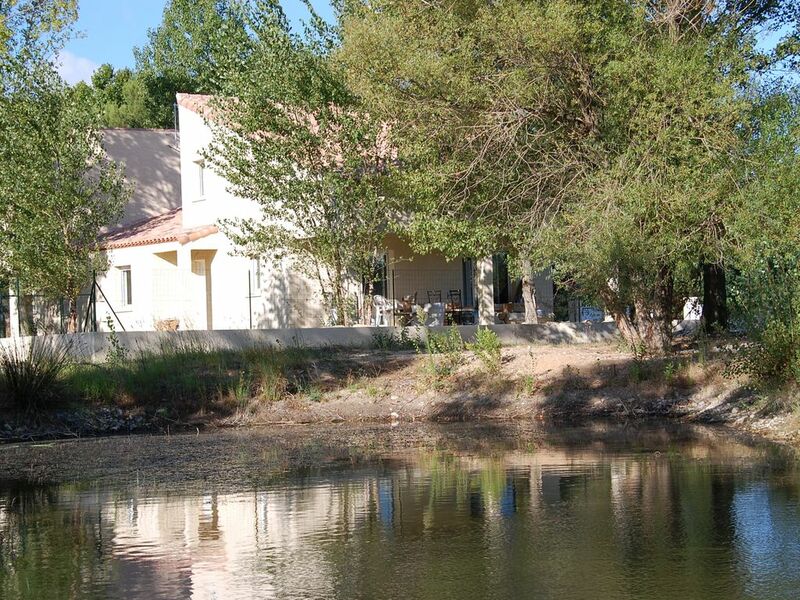 The villa designed for relaxation in the heart of a property of 8 ha is nestled between an artificial lake created after 2 hectare exploitation of a career, and the Hérault river that borders the property on 400mt to offer many places to swim and relax. Ideal for fishing, water activities are furthermore possible (pedal boats and canoes dispostion) .Finally, nature enthusiasts will be delighted by the richness of the flora and fauna present.